This curious tree is distributed in almost all the forests of Amazonas, Pará, Rondônia, and the Territories of Amapá and Roraima, as well as the Guainas and portions of Central America, where it is known by various popular names such as "manwood" in Nicaragua and Panama, "minquart" in French Guiana, etc. 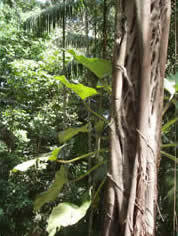 Acariquara occurs in high forests on sandy clay soils, attaining heights of 20-25 meters, forming a straight, cylindrical trunk without buttress roots, The most notable characteristic of this species are the holes of deep furrows in the trunk, from which its name is derived, which means "hole of the acari fish"; this fish presumably uses such holes as shelter when trunks of the tree are submerged. The leaves of acariquara are elliptical, sub-coriaceous, with obtuse or rounded bases and acuminate apices, measuring more or less 16 cm in length and 4 cm in width; the lateral veins, which are comprised of 11-12 pairs, are uniformly parallel, straight or slightly curved; the 2-3 cm long petioles are strongly channeled. The flowers are tiny, 2-3 mm in height and arranged in axillary spikes 6-7 cm long. The fruit is a single seeded, oblong drupe, approximately 2 cm long, and purplish in color. The wood is hard (density = 0.9) and never splits. Because of the hoes in the trunk, the wood f this species is never sawn but is nevertheless extremely valuable, not only due to its durability when in contact with the soil and its resistance to humidity and insect damage, but especially due to its capacity to support heavy loads. After removing the bark and polishing the trunk, the wood of this species assumes a magnificent, highly decorative quality and is frequently used in certain types of rustic constructions. In rural areas of the Amazon it is often used as posts for telephone and electric wires.